One of the simplest heroes in the League, Sion was created early on, with AP Sion sporting literally two moves. However, in this world of fast-flying blinking assassins, he's looking a little out of place according to RiotIronStylus, and needs new visuals. Badly. Scion is an interesting case. Absolutely, the dude needs a visual update BADLY. Grumpy Monkey has some ideas here, some very good ideas. I agree that he fits into that weird area that some older champions fall into, where the visual theme doesn't really match the look. Scion wields a giant axe, one which, by today's standards, you'd expect to be chopped in half with. But, as has been mentioned, he's more of a Mage. Same thing goes for Mordakieser, big mace dude you'd expect to be bonked on the head by, instead he casts a lot of spell and.. nabs your ghost? Meanwhile, these days, we want to create a fantasy that people can easily buy into. 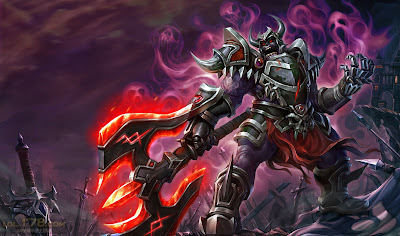 Darius is a proper axe dude, he wants to chop you with said axe, and as him you want to chop people down with said axe. Diana almost fell into the aforementioned problem with Scion and Mord. She's an AP champion with a melee weapon. That can be tough. But we needed to figure out what you would want to do with Diana. Big weapon, you probably want to slash people with said weapon. How do you do so? Give her moon magic, which needed to be part of her theme, which helps her with gap closes rather than poke. Fulfills that fantasy of self-immolation. Dive in, slash, burst, don't expect to survive. Expect to be the heretic martyr. Do I not look COOL enough for you?! I just like the voice over. It is indeed a very cool voice over. Oh boy :P Not sure if I went to open that door! I also don't know enough references to make a page like that. Thanks for the suggestion though!